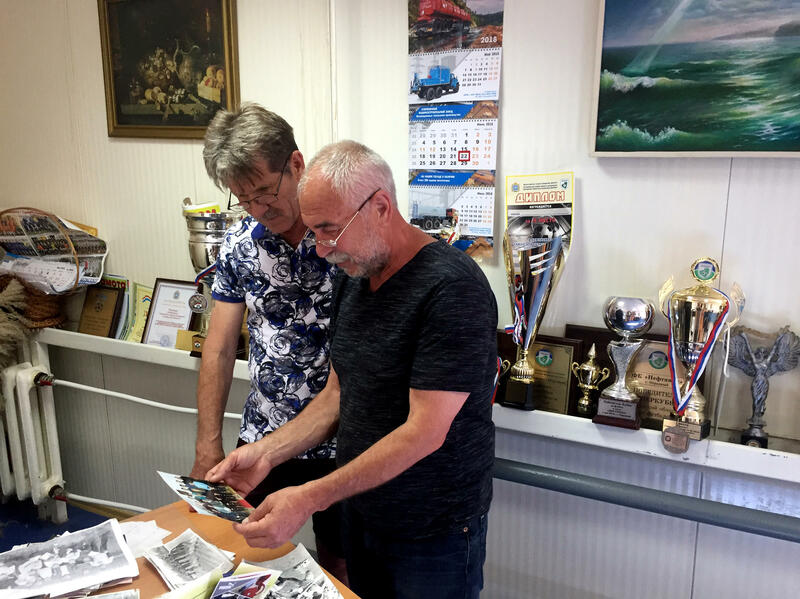 Aleksandr Purgayev (left) and Aleksandr Selyukh grew up together, and both played for their town's soccer team in the 1970s. Purgayev is now the team's coach. My father says as a child, he regularly sneaked out of his first-floor apartment here to play soccer or hockey at the stadium behind this fence. 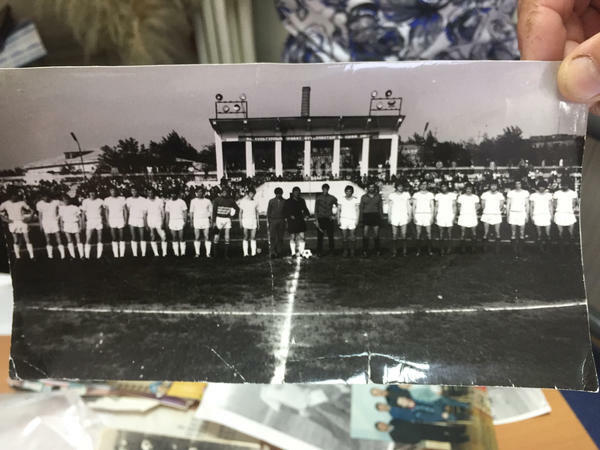 In 1976, Aleksandr Purgayev and his team played a rare foreign visiting team, from Bulgaria. "All the roofs were covered with people," says Aleksandr Selyukh. "Boys climbed all over the trees, light posts, fences." Purgayev is reflected in the trophy case mirror in the lobby of the stadium office building. His team is one of the best in the region and has contributed many of the displayed awards. 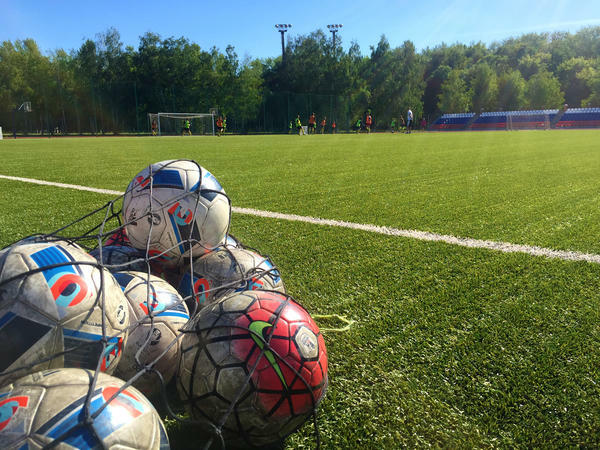 Youth coach Valeriy Kruntiayev says he's been using World Cup matches as material for training and has even overheard preschoolers discussing the games. Captain of the youth team, 14-year-old Amir Tabarov, says the World Cup is motivating him to try to make it onto Russia's national team in time for the next tournament. Millions of Russian adults and children play soccer. In covering the World Cup, I asked dozens of Russians how long they've been watching or following soccer. It's been so long, many couldn't remember. Since elementary school? Maybe since middle school? One young woman said she was born wrapped in a football flag. In my father's hometown of Otradny ("Joyful," pop. 50,000), the stadium is about 50 miles from the brand-new Samara Arena hosting some of this year's World Cup matches. He now lives in Samara, but we've returned to meet one of his best friends from childhood, whose whole life has been devoted to the sport. The two of them grew up in apartments next door to each other. Both are named Aleksandr, both are the same age. 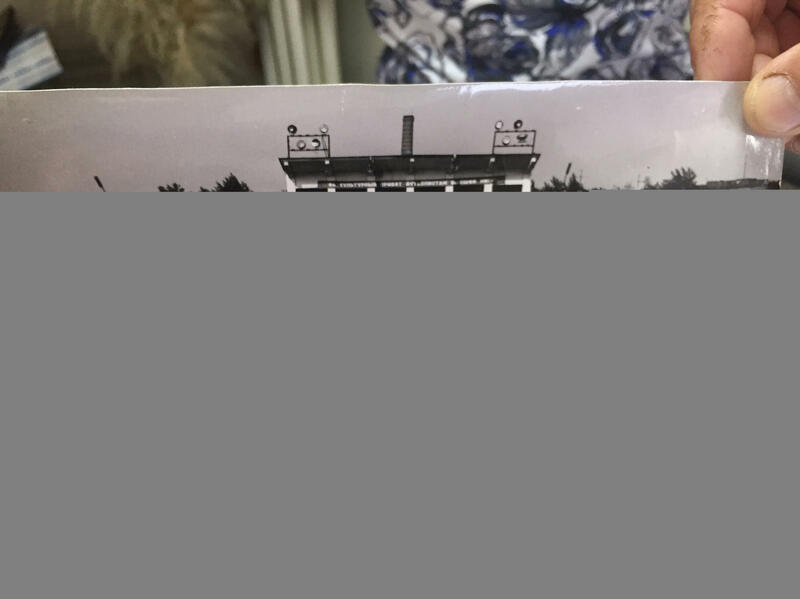 In the 1970s, they both played for the town soccer team called "Neftyanik" ("Oilworker," after the profession that created this town after World War II). My father's friend, Aleksandr Purgayev, is still on that team — he's the coach. "Football is my life, it's everything," Purgayev says, standing over the desk in his office piled with black-and-white photos of young men in jerseys posing with or rushing after a soccer ball. Trophies and plaques are propped up everywhere there's a flat surface. More of them are downstairs, by the main entrance, glistening in a grand display case. His team is one of the best in the region. They win so many tournaments that Purgayev has to put on glasses and read the engraving to recall what each trophy is for. Players regularly go on to professional leagues and become coaches; one guy became a goalkeeper on the national team for beach soccer. Here in Otradny, the players do get paid, but they're amateurs with other day jobs. Except for Purgayev, for whom soccer is the day job. "For a long time now, all my family has understood," he says, "my wife and kids, they know — they used to say, 'You and your football!' but now they say, 'Dad is at work.' "
Purgayev and my father both say there probably isn't a single Russian guy who's never watched a match. 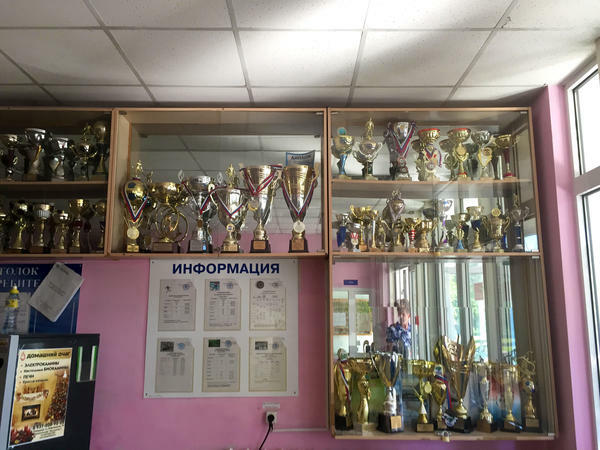 Purgayev says their town games draw all kinds of people — up to a thousand in the stands — a lot of retired men, sure, but also girls, women with children. As far as sport goes, soccer is pretty accessible. It doesn't require expensive equipment, just some shoes and a patch of dirt. It's just something you do as a kid, during recess in school, with friends in the yard, or in today's case, a fancy field. On one side of Otradny's stadium is a cluster of tiny children, maybe 5 or 6 years old, kicking the ball around. On another side, a tall man towers over a squad of teenagers. His name is Valeriy Kruntiayev. His own soccer career had started here before he went off to several football academies, played semi-pro and pro, got an education degree and came back to train the next generation — and play on Purgayev's adult team. "I remember when I was little," Kruntiayev says, "we had a shortage of players and our coach went to different schools and talked to boys, trying to convince them to come to practice. But now we don't have such a problem, we might get 30, 40, even 50 people coming. Everyone wants to train." The changing room bursts into raucous laughter when Kruntiayev summons one member of the team to talk to the reporter lady. The team is all teenage boys, except for one, who's a teenage girl. Amir Tabarov comes bounding out. He's 14 and the captain of the team. He tells me his favorite players are Portugal's Cristiano Ronaldo, Brazil's Ronaldinho — and his older brother, who is currently on Otradny's adult men's team and inspired him to get into soccer. The World Cup is motivation to try to make it onto Russia's national team in time for the next tournament, Tabarov says. "It'll be in four years, I'll be 18 years old," he says. "Maybe I'll be representing Russia." Coach Kruntiayev is wearing a "Russia 2018 FIFA World Cup" T-shirt at today's practice — he says he's been using the matches as material for training and has even overheard the little preschoolers discussing the games. "You watch TV and think it's like a parallel universe that you'll never see or know except on TV," he says. "But here you realize [the famous players] are real, and here they are in Samara. You can go there and see." Now, at the World Cup in Russia, one group of fans is watching with special interest - Russians who play soccer as well as watch it. NPR's Alina Selyukh grew up in Russia and is covering the World Cup. She spoke with three generations of Russian soccer players, starting with her own family. 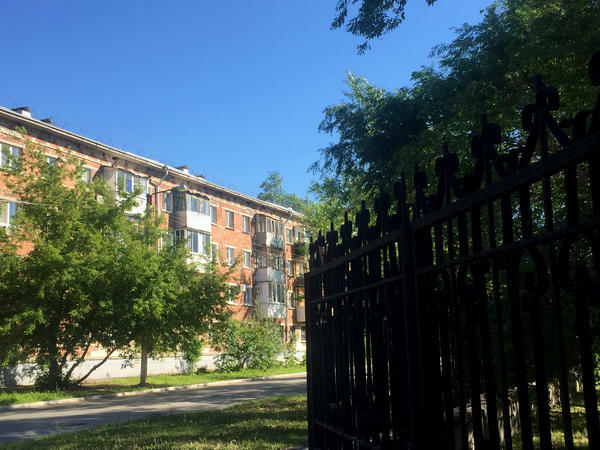 ALINA SELYUKH, BYLINE: My father parks the car in front of a five-story apartment building - red brick, balconies jutting out. ALINA SELYUKH: He says, that window on the first floor, that was his room as a kid. I immediately see the stadium. It's directly across the street. ALEKSANDR SELYUKH: (Through interpreter) Mom would send me off to do homework, but I'd go quietly to the window - hop - and off to the stadium. ALINA SELYUKH: It was hockey in the winter, soccer in the summer. Though, of course, my father would call it football. This was the '60s in the Soviet Union. And today, my dad - his name is Aleksandr, by the way - he brought me back to his hometown of Otradny - population 50,000 - to meet one of his best friends from childhood. His name is also Aleksandr - Purgayev. He grew up one door down. Together with my dad in the '70s, he joined the town's soccer team. And Purgayev, he's still on it. Well, he's the coach. ALINA SELYUKH: His office has two birds in hanging cages and trophies and plaques propped up everywhere there's a flat surface. His team is one of the best in the region. His players occasionally go on to professional leagues. Here in Otradny, the players do get paid, but they're amateurs with other day jobs, except for Purgayev, for whom soccer is the day job. ALEKSANDR PURGAYEV: (Through interpreter) Football is my life. It's everything. For a long time now, all my family has understood. My wife and kids, they know. They used to say, you and your football. But now, they say, Dad is at work. ALINA SELYUKH: Purgayev says their town soccer games draw all kinds of people, up to a thousand in the stands. A lot of retired men, sure, but also girls and moms with children. Plus, soccer is also more accessible to play. It doesn't require expensive equipment, just some shoes and a patch of dirt. It's just something you do as a kid during recess in school, with friends in the yard, or in today's case, on a fancy soccer field. Here in the stadium, on one side, there's a cluster of tiny children, maybe 5 or 6 years old, kicking the ball around. On another side, a tall man towers over a squad of teenagers. His name is Valeriy Kruntiayev. He plays on Purgayev's adult team and also trains this youth lineup, which is where he got his own start back in the day. VALERIY KRUNTIAYEV: (Through interpreter) I remember when I was little. We had a shortage of players, and our coach went to different schools and talked to boys trying to convince them to come to practice. But now, we don't have such a problem. We might get 30, 40, even 50 people coming. Everyone wants to train. ALINA SELYUKH: Kruntiayev had left Otradny to attend football academies and play semi-pro and pro for a while, got an education degree and came back to train the next generation of players. ALINA SELYUKH: Amir Tabarov draws the short straw to have to talk to the reporter lady. He is 14, and so are most of his teammates, one of whom is actually a girl. I ask him to name his favorite players. ALINA SELYUKH: His brother, who plays on the town's adult men's team together with the youth coach, Kruntiayev. From where the teenagers are playing today, it's about 50 miles to the Samara Arena, one of the stadiums hosting this year's World Cup. The youth team was actually in the drawing to be ball boys for the tournament but didn't get in. Coach Kruntiayev is wearing a World Cup T-shirt. He says he's been using the matches as material for training and has even overheard the little preschoolers discussing the games. KRUNTIAYEV: (Through interpreter) You watch TV and think it's like a parallel universe that you'll never see or know except on TV, but here you realize they're real. And here they are in Samara. You can go there and see. ALINA SELYUKH: The boys on the youth team told me they're feeling motivated by the World Cup, wanting to be on the Russian team when the next one rolls around. Amir Tabarov points out they'll be 18 by then. Alina Selyukh, NPR News, Samara, Russia. Transcript provided by NPR, Copyright NPR.